Wedding dress shopping is fun and exciting, but it can also be overwhelming if you don’t know what you want. To find the right wedding dress, you may first have to look at hundreds of options. So, don’t hit the stores till you have narrowed down your preferences to a select few. Plan in advance and your wedding shopping will be productive and enjoyable. This article will help you understand how to prepare for your bridal boutique appointment, so you can make the most of your experience. 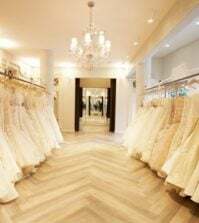 There are three main processes, when it comes wedding shopping –determining the type of dress you want, finding the right bridal boutique and finding the dress. The entire process may take anywhere between 6 and 12 months. A little research before shopping will make it easier and much more effective. While some brides know exactly how they want to look on their wedding day, others may not have a clue on where to begin. Don’t worry, we’ll help you get there. First, find a silent spot and sit down with a pen and paper. Close your eyes and imagine your wedding day. Do you envision yourself as a traditional bride in a classic white wedding gown? Or do you picture yourself as a fashionable, stylish bride in a modern wedding dress? Depending on your preferences, write down a few describing words for the gown you have in mind. Now, look for dresses that match your idea. Browse through online wedding gown collections and photos in bridal magazines to find inspiration. Save these for reference, and make notes on what you like and what you don’t in a particular dress. Ask your friends for suggestions on what would look good on you. Once you begin doing this, you will slowly zero-in on the features you want, and eliminate those you don’t. You should soon be able to shortlist suitable silhouettes, type of sleeves, neckline and length. It’s now time to move on to the next step. The worst thing that can happen when you go shopping, is to fall in love with a dress you cannot afford. So, fix the maximum amount you can spend on your wedding dress and make sure you stick to it. Budget for accessories like veils and shoes too. Now, find a boutique that carries the dress collections you like. You can check online or call them to confirm availability of these collections. Although you can buy a dress online, remember that you may not be able to judge how the dress would look on you till you actually try it on. Book your appointment and go shopping! Once you finalize the boutique, fix an appointment with them on a day when you have plenty of time to shop. If there are any particular dresses that you liked, inform them so they will have it ready when you arrive. Take a friend or two with you, when you go shopping. Limit the number of people who accompany you, as too many opinions will only make the decision difficult. Choose someone who is fair in judgement and will give you an honest opinion. Now, all you have to do is attend your appointment and find your dream dress! Visit Best for Bride to browse through our vast selection of wedding dresses and for all your other wedding needs. Love it..love it…love it!!! Love you guys work and what it represents♥ Thinking about doing the same, wish my marriage the best as I expected!!!! In not even thinking about it, I would have skipped the accessories and things like that when planning for the dress. Thanks for the heads up and the eye opener! I am not gonna lie, getting a good start, early is a great idea! These tips will keep the stress level low.